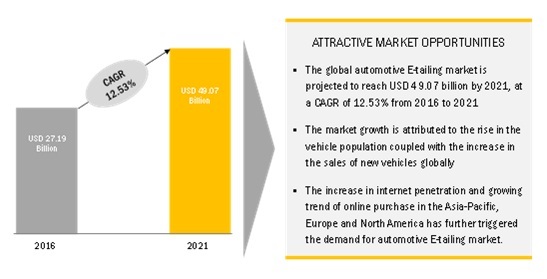 [178 Pages Report]The global automotive E-tailing market is driven by the increased demand for the automotive parts and components as the average age of vehicles is increasing. The convenient shopping experience has driven customers to online purchases. E-tailing is also helping brick-and-mortar auto parts retailers to reach more consumers through the internet. The global automotive E-tailing market in 2016 was valued at USD 27.19 billion, and is projected to grow at a CAGR of 12.53% during the forecast period. The base year for the study is 2015, and the forecast period is from 2016 to 2021. Which vehicle type will lead the automotive E-tailing market (PC, Two-wheelers, and Others)? What are the industry trends in the automotive E-tailing market? Which player will dominate the automotive E-tailing market regionally? What are the upcoming technological developments in the automotive E-tailing Market? Which automotive component has the largest market size in the automotive e-tailing market? The objective of the study is to define, describe, and provide a detailed analysis of E-tailing in the automotive industry. 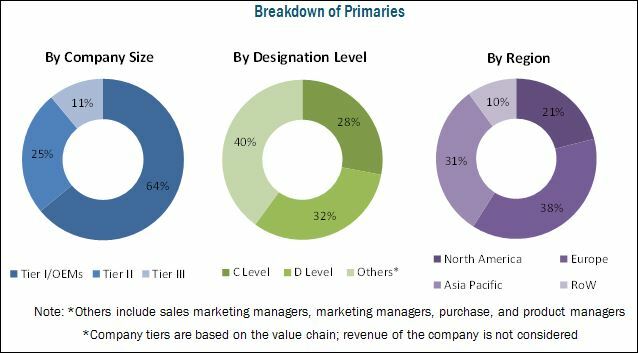 The report segments the market by vendor, by component, by vehicle type, by product label and by region. 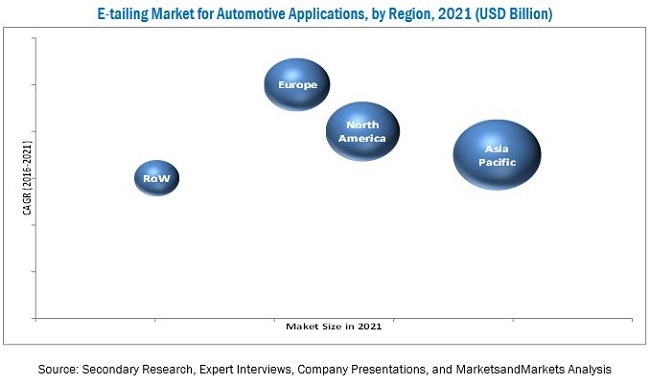 The primary aim of the research study is to provide in depth analysis of the global automotive E-tailing market by value, and detailed analysis of the dynamics driving the automotive E-tailing market. A detailed study of various market leaders has been done and opportunity analysis has been provided in the report. The global automotive e-tailing market is projected to grow at a CAGR of 12.53% during the forecast period, to reach USD 49.07 billion by 2021 from an estimated USD 27.19 billion in 2016. The base year for the report is 2015 and the forecast year is 2021. The current vehicle population, increasing automobile sales, and increasing penetration of internet has led to the increase in online sales of automotive components. The online sales of automotive components through third party vendors such as Alibaba Group Holding Limited, Amazon.com, Inc., and O’Reilly Auto Parts etc., are estimated to show the fastest growth during the forecast period The increasing internet penetration coupled with discount offered are pushing the online sales of automotive components. Low pricing strategy and multiple online offers, coupled with the facility of comparing parts online based on specification, price, and guarantee are further driving the automotive e-tailing market. The online sales of automotive components for the passenger car segment is the fastest growing segment in the global automotive e-tailing market. The growth can be attributed to the growing sales of passenger cars across the globe coupled with the present passenger car population of about 1 billion. The increasing internet penetration, rise in the sales of passenger cars, existing vehicle population and the time and cost convenience of purchasing parts online are the major factors which are contributing to this growth. North America is the leading the E-commerce software platform market in 2016 but by the end of the forecast period, the Asia-Pacific region is projected to lead the market. Some of the key drivers for this growth trend include the presence of a large number of SMB retailers in the region, increasing consumer spending on e-commerce, and increased adoption of SaaS and mobile technology. The Asia-Pacific region has the largest market share in the automotive e-tailing market. China is the largest market, followed closely by the U.S., because of its advanced technological infrastructure, high internet penetration, and huge vehicle population. Branded automotive components are the major shareholding segment in the global E-tailing market with around 70% of the market share. The demand for quality products coupled with the guarantee associated with branded automotive components has driven the demand for branded components in the global E-tailing market. The infotainment and multimedia is the collection of hardware and software which provides audio and video entertainment. These infotainment and multimedia systems includes applications such as dashboards, connectivity device comprises bluetooth, and the audio-video systems. Increasing demand for the advanced convenience and comfort systems will grow the infotainment and multimedia market. The interior accessories include the products like seat cover, perfume, foot mats, and seat belts. The interior accessories market is highly dominated by the counterfeit label products and third party vendors, due to the wide range and low cost offered by them. The OEM manufacturer of seat belt are Autolly Inc., TK Holding Inc., and Takata Corp. The products offered under engine components are engine block & cylinder heads, pistons & rings, bearings, and valves & filters. The demand for tires and wheels is higher than other auto parts. There are many OEM manufactures of tires who adopted the medium of E-tailing to sell their product directly to the end customer. Delticom AG is one of the leading automotive tire online retailer in Europe. Other tire OEM manufacturers such as Continental, Goodyear, and Pirelli. The electrical products under automotive component E-tailing market offers the products such as batteries, ignition systems and parts-spark plug, and lightning equipment. Where will the e-commerce software technology take the industry in the long term? Will the industry cope with the challenge of continuously updating products and technology of E-tailing market? How do you see the impact of the online payment frauds in the automotive E-tailing Market? The major restraints considered in the study include the threat of late delivery, online payment frauds and counterfeit parts which restricts customers from purchasing automotive components online thus curtailing the market for automotive E-tailing. The lower internet penetration in countries such as China, India, and Brazil is another restraint for the global e-tailing players as the Asia-Pacific is the largest market for vehicle production and sales. These factors could negatively affect the growing demand for automotive e-tailing services in the global market and could restrict growth. The global automotive e-tailing market is dominated by many international as well as domestic players, and some of them are Advance Auto Parts (U.S.A.), Alibaba Group Holding Limited (China), Amazon.com Inc. (U.S.A.), Delticom AG (Germany), O’Reilly Auto Parts (U.S.A.), Flipkart (India) and eBay Inc. (U.S.A.) etc. 13.9 Advance Auto Parts, Inc.